Hey everyone! Today I'm excited to tell you about a new blog that just launched called My Colortopia. It's a must-see site filled with a great lineup of bloggers who will be writing about their main sources of inspiration and personal experiences with all things paint and color! Check out the talent, some of my favorite friends! And that's not all of them. Check out the rest of the My Colortopia contributors, along with their bios, at the My Colortopia site. I love the concept of My Colortopia. 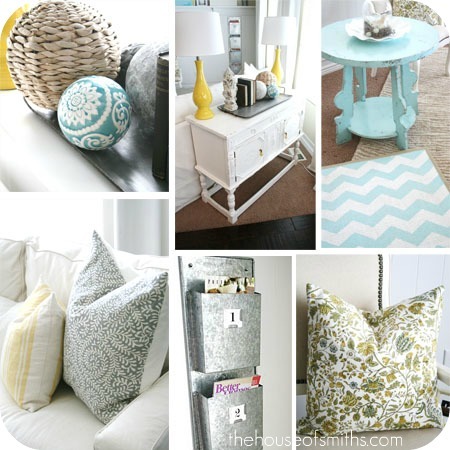 It's a site full of great ideas on how to decorate with color, and bring your house to life, with tips and tricks shared by lots of your favorite bloggers! It's a destination where people who are easily overwhelmed by interior design decisions and painting can easily get advice, guidance and inspiration. Let's go ahead and admit... picking out the perfect paint color for a living room wall, learning new painting techniques or knowing what colors look best together is not easy! So these pros are here to help you out! To get started, My Colortopia has created this awesome new widget (below) called My Life, My Colors, that helps you to find out what color schemes best represent YOU, based on a few multiple choice questions that you answer about your personality and lifestyle. There are so many things that inspire me, but mostly I'm drawn to comfortable, mixes of modern, natural country and vintage elements. Take the quick My Colortopia by Glidden paint personality test and see what colors could best suite you, for YOUR next home painting or decor project! * I have partnered with Glidden/Akzo Nobel Paints to participate in the My Colortopia program. However, all thoughts and opinions expressed are my own. This is awesome! It really helps take the guess work out of choosing the right paint color! Love it! Holla girl, so excited to read this! And you have some of the prettiest Glidden shades in your home that I love! Thanks for the linky love friend! Sweet! We're going to be re-doing our bathrooms and hallways. Color??? No clue. Thanks for pointing me in the right direction!! THANKS for sharing this!!! I am right in the middle of trying to decide on a living room paint color! Great article thanks for sharing. I went to the My Colortopia site and took the quiz. Really like the results. Thanks for putting my face in your post.